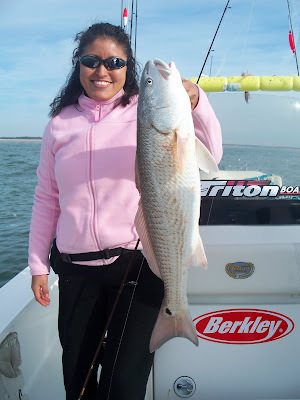 I just got back from Wilmington and the Fisherman's Post Fishing School... figures, the weather turned to Yuck! 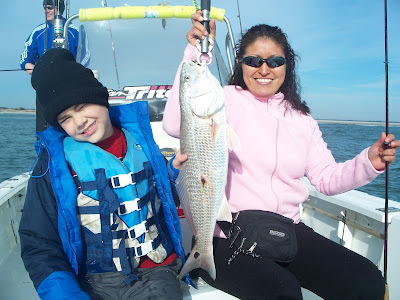 Anyway, I had the Anderson group wanting to hit the surf for Redfish but the wind and swell wouldn't let that happen. 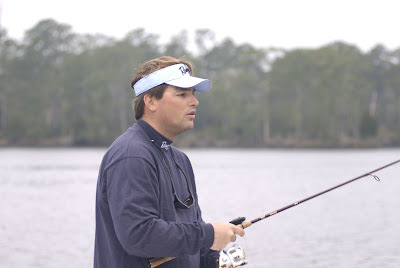 Instead, we moved into the backwaters and were able to pull out the morning before the wind and rain settled in. 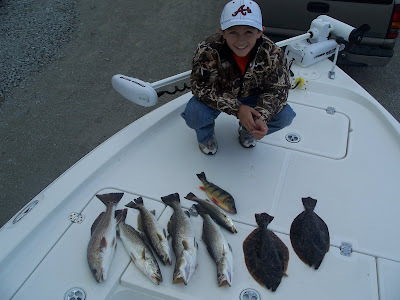 Check out Jacob with a shot of some of the fish we caught for the day... We wound up landing 8 Speckled Trout (kept 5, largest at 2.25lbs), 1 Redfish (24in. 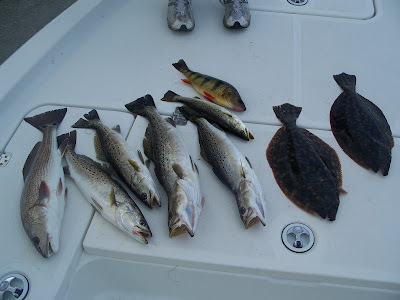 ), 4 Flounder (kept 2, both 2lbs), 2 striper (released both), 1 LargeMouth Bass (16in. ), and 1 Raccoon Perch (1 lb). Great job today guys! 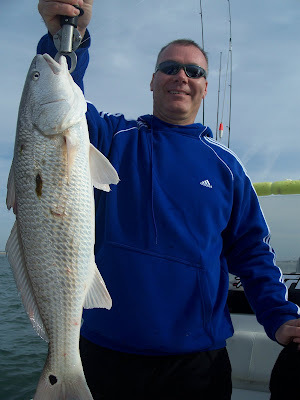 I had the Pleasure of fishing this morning with regular clients Rob and Wes aboard. There was a little chill in the air which eventually dissapated as it turned comfortably warm. 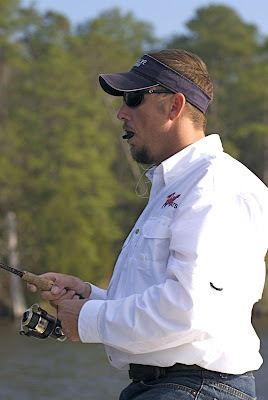 We fished primarily up river and worked Berkley Gulp Pogies fished on light jigheads as well as the new Mirrolure 3in. shad imitation. 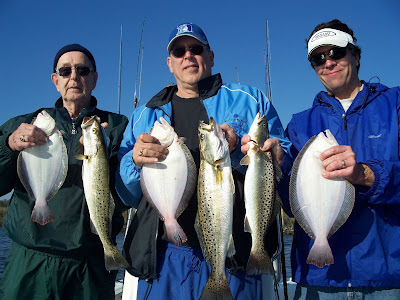 We never really wore them out but were lucky enough to land fish steadily throughout the day. Not bad for February. 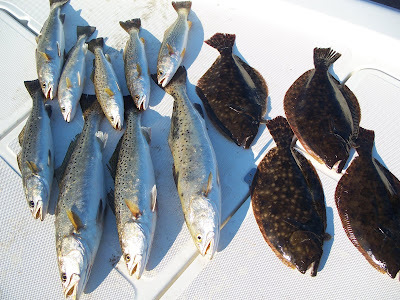 We wound up landing 9 Speckled Trout (kept 7 with the largest at 2.5lbs), 8 Flounder (kept 4 between 15 and 18in. 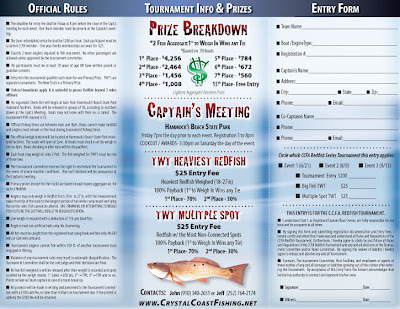 ), 2 Gray Trout ( 13 to 14in.) 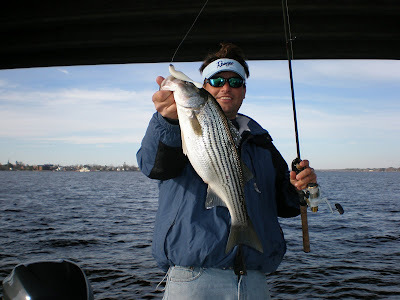 and we released a couple of undersized Striper, Puppydrum, and a LargeMouth Bass about 15in. As usual, very enjoyable having you guys onboard! 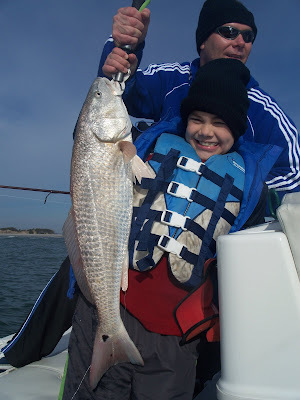 I had the pleasure of having Todd W., his wife Liz, and son Josh onboard this morning. It was an absolutely beautiful morning with mild temperatures. On the other hand, the water conditions weren't the best to work with... The ocean had quite a bit of swell and very dirty water from the recent 30+mph Southerly Blow. And, although water clarity is excellent in the backwaters, we're experiencing extreme low tides associated with the approaching New Moon... Currently, durinig high tide the oyster rocks and sand flats are out of water. 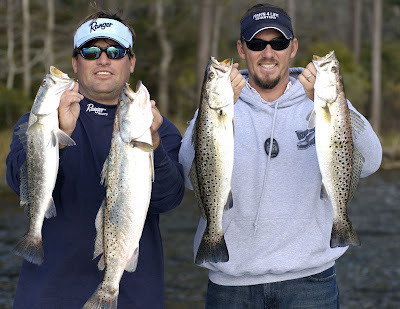 Well, We took advantage of what little high tide we had and spent an hour trying for some trout. Good news is we landed 5 trout... bad news is they were all between 11 and 12inches and not worth saving to eat. Shortly after, we moved on to locate some reds in the White Water outside the inles. Well, after 9 miles of trying to look through very cloudy water we were about to give up... but, the Fish Gods smiles upon us! 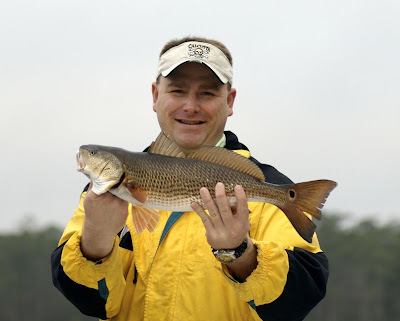 I stopped along a shoal that often holds redfish and we began blind casting into it... Low and behold on 2nd cast Todd hooked up a big redfish. 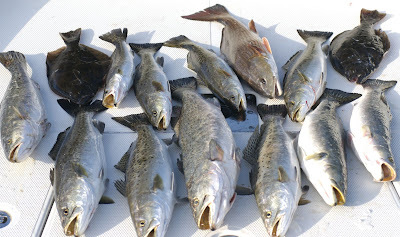 We maneuvered around the shoal into better range and we could just barely see the reds. 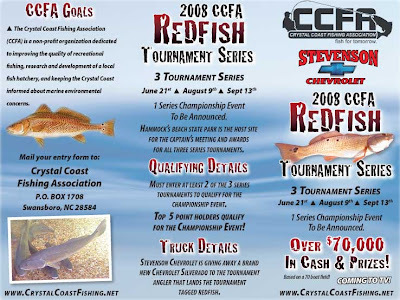 There were about 1500 to 2000 redfish in the school. 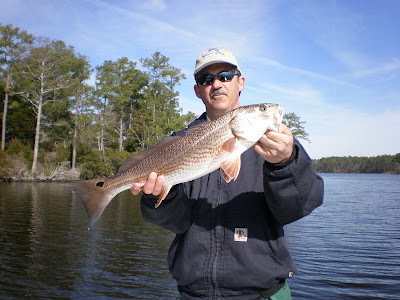 We fished them for about an hour and a half and managed to catch and release about 25 redfish between 24in and 31in. Back at the dock by 11am and in time for Todd and his family to get home and ready for the Super Bowl as promised.... Great Job Guys! It was very enjoyable having your family onboard today. Take care and I hope to see you again soon.